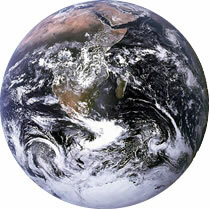 EarthFacts.com is where you can find everything you need to know about Earth and the living things on it. Browse through our pages to learn about how the Earth formed and how life developed. Find out about the oceans and the continents. Learn why earthquakes and volcanoes occur. Discover what happens deep beneath the Earth's surface, in the oceans and in the air above us. Learn about weather and climate. Find out more about the Earth's rainforests. You can even try some science experiments. 1. There are 8 planets in our Solar System (group of planets surrounding a sun). Earth is the 3rd planet from the Sun. 2. So far life has only been discovered by us on Earth and nowhere else in the universe. 4. Earth is the only planet in our Solar System with liquid water on its surface, an essential ingredient for most life as we know it to exist. 5. Earth is the 5th largest planet in our Solar System; however the only planets larger than Earth are Gas Giants - planets whose mass is mainly made up from gasses with no solid surface to land on. 6. The Earth is currently believed to be 4.6 billion years old, although it has been transformed many times during this period before it became the Earth as we know it today. 7. It is thought that life has existed on Earth for 3.5 billion years, starting out as extremely primitive single celled organisms before evolving into more complex bacteria and eventually into plants and animals much, much later. 8. Most life as we know it - sea creatures, reptiles and mammals - stem from a period of massive growth and evolution only 533 to 525 million years ago called the Cambrian period. 9. Dinosaurs were the dominant creatures on Earth for 150 million years before they mysteriously disappeared relatively quickly, leaving only smaller reptiles and mammals behind. Current theory suggests a cataclysmic event, most likely a giant meteor, was the cause of their extinction. 10. Humans have only been on Earth for about 3 million years in earlier forms, and less than 200 thousand years as Homo sapiens (our current species). However, modern forms of Homo sapiens, behaving as we do today, are thought to have only been around for 50 thousand years. A metaphorical blink of an eye compared to life on Earth in its entirety. The Earth is our only home. Help the World Wildlife Fund keep it beautiful and safe.